"Onehub provides secure enterprise file storage and sharing." Onehub scored 84/100 in the File Transfer & Sharing category. This is based on user satisfaction (77/100), press buzz (48/100), recent user trends (rising), and other relevant information on Onehub gathered from around the web. Onehub is a web-based collaboration solution and virtual data room that enables users to store and share loads of sensitive business files with confidence and in a secure manner. The software can be fully customized and tailored to meet the specific requirements and custom branding of users and businesses. Onehub file transfer and sharing software offer a wide range of robust features and capabilities to facilitate such processes in an efficient and secure way. Features like drag-and-drop document uploading, folder organization, version controls and archiving, and full-text search are just a few of the many tools and applications that come with the cloud-based software solution. Onehub is best suited for small and medium-sized businesses and large organizations that require a secure and robust solution to handle file transfers, storage, and sharing on a day-to-day basis. The platform is specifically designed to provide a highly secure and stable environment for the storage and sharing of important business files. Onehub is an enterprise-level file transfer and sharing solution tailored for SMBs, as well as larger organizations. It’s a file sharing service that helps businesses share and control files in the cloud in a safe and secure way. The online solution serves as a one-stop suite to easily manage, store and share crucial company files. Onehub helps users share files efficiently through secure links and role-based permissions. It provides workspaces that come with user management and access controls. The cloud-based file transfer and sharing solution also enable users to post comments, manage workflow tasks, send emails, create dashboards, as well as receive alerts pertaining to new posts and files. 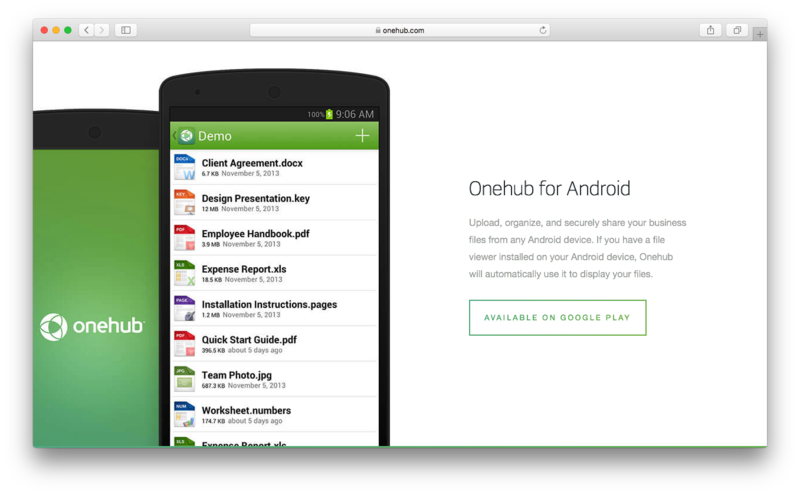 Other core features and capabilities of Onehub includes quick and easy file upload, customizable branding, files preview in web browser, invitations, secure access to files from anywhere, unlimited storage capacity, collaboration tools, password reinforcement, agreements before workspace usage, two-factor authentication, Google Drive file editing, data room security, and more. Moreover, Onehub also supports multiple file types, offers data export options, and has automatic file deletion capabilities. It provides native mobile apps for both iOS and Android devices, thus increasing accessibility and functionality since it enables users to access the platform through their mobile device anytime and anywhere. In addition to the two-factor authentication security feature, Onehub also comes with audit trails and document watermarks. Onehub uses 256-bit encryption, as well as physical security policies similar to banks and other financial institutions, to maximize file transfer and storage security. The software solution employs multiple methods to make sure business data is secured while in transit or at rest. By utilizing SSL, every communication is delivered over a secure, well-encrypted connection. The service is monitored on a 24-hour basis. Onehub is designed with the user in mind. It gives particular attention to details. When the user shares a file online or in the cloud, they can set role-based permissions to ensure the safety and security of the documents being shared. Onehub utilizes up to seven different roles, each having their own preset limitations. This method helps to maintain the transparency and security of the information being exchanged. To ensure more effective and productive collaboration, Onehub enables users to customize storage space the exact way they prefer. Businesses can add their brand logos and set attractive professional color themes to set their branding apart from the competition or to make it look more appealing to other users. The file types and formats that Onehub supports are virtually unlimited. Users can store and share audio files, PDFs, spreadsheets, and many other file formats. These files, however, can be limited to specific users through permission controls. Users also have unlimited storage options, although there is a limit to the size of the file they can store and share, i.e. 5 gigabytes. Onehub offers white labeling and custom domains to further customize the storage space of businesses and organizations. Another crucial feature offered by Onehub is the document watermark function. It helps to make sure all files and documents going through the communication channels are authorized and will not be misused by any individual in case something goes wrong. Although Onehub is relatively user-friendly and has a rather short learning curve, there is software training available for users so they can take full advantage of the more advanced features the cloud-based file transfer solution offers. The online platform supports text searches as well as an unlimited number of users. Integration with other applications is another clear benefit from using Onehub. 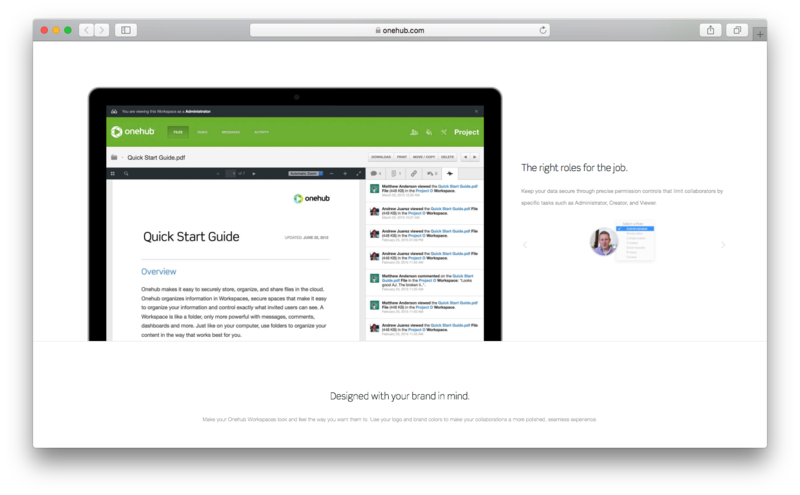 The web-based solution integrates seamlessly with Dropbox and Google Drive. Dropbox users can use Onehub as a layer onto their Dropbox files and documents to get access to the Onehub features. In the same token, Google Drive enables Onehub users to create and edit Google Docs within the Onehub user interface. Onehub offers three paid enterprise plans to address the needs of different users, from small startups to large enterprising companies. A 14-day free trial is available for all interested parties and the pricing packages are pretty straightforward and easy to set up. Interested parties may visit the Onehub official website for more information about the product, its features, and more complete details about the different pricing plans and perks that come with each one. Onehub is a decent file transfer and sharing software solution for businesses of any size and any number of users. It offers a reliable and secure file sharing technology for businesses across different industries. It offers a fast, easy, and secure method for uploading and storing files in the cloud. Onehub also integrates seamlessly with both Google Drive and Dropbox for increased functionality and efficiency. Onehub provides a fully customizable user interface for a comprehensive and effective branded user experience. Based on the pricing packages, Onehub is tailored to meet the needs of businesses of all sizes, paying close attention to the different budget limitations of each company or organization. Does Onehub integrate with any other apps? Who are the main user groups of Onehub? Does Onehub offer multi-user capability (e.g. teams)? What platforms does Onehub support? Does Onehub offer guides, tutorials and or customer support? What is Onehub generally used for?